Daniel Gaines launches a winning idea. “Once you set foot in that room, you have no way of knowing who’s going to be there and where your ideas are going to go,” said Island high school junior Daniel Gaines after winning second place at Startup Weekend Blue for Blue Network, a website that advertises job openings in the blue economy. 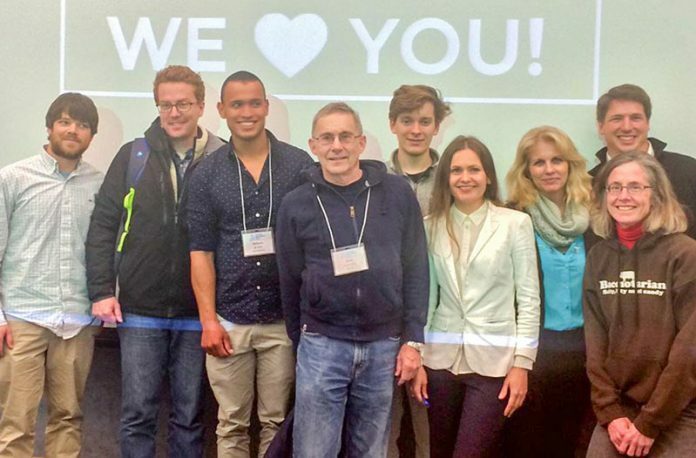 Startup Weekend Blue is an intensive three-day workshop focused on developing entrepreneurial projects in the blue economy that was held April 1-3 at the Woods Hole Oceanographic Institution. The blue economy has to do with jobs that relate to water, salt or fresh, from studying marine biology to developing a water purification system. Daniel Gaines’ idea, Blue Network, is an advertising site for jobs specifically relating to the blue economy. Twenty-five entrepreneurs and 10 coaches worked on five water-related business ideas during the business accelerator event, which was sanctioned by the global Startup Weekend organization and attended by 45 to 50 people, including potential investors. To his knowledge, there isn’t any kind of Craigslist-style website specifically for blue jobs, and upon checking job listings in the local area, he found that companies looking for people trained in blue fields have had openings for months.